A series of executive orders signed by President Obama since his first year in office requires all federal agencies to begin planning for climate change and produce an updated adaptation plan by May of this year. The Pentagon is a little late, but today they released their second-ever climate roadmap. The roadmap is an update to the U.S. military’s first climate roadmap, released in 2012, and largely echoes the frank assessments of climate change’s impact on national security seen in Department of Defense strategy documents since the 2010 Quadrennial Defense Review. “Climate change will affect the Department of Defense’s ability to defend the Nation and poses immediate risks to U.S. national security,” the new roadmap says. These climate-related effects are already being observed at installations throughout the U.S. and overseas and affect many of the Department’s activities and decisions related to future operating environments, military readiness, stationing, environmental compliance and stewardship, and infrastructure planning and maintenance. The roadmap is explicitly about adaptation, not mitigation. The Department of Defense is one of the largest emitters of greenhouse gases in the world, thanks to its immense fuel and energy consumption, but plans to scale back and increase efficiency are reserved for its annual Strategic Sustainability Performance Plan. Each section of the roadmap provides a progress report on these goals and a more detailed agenda for what still needs to be done. The Strategic Environmental Research and Development Program (SERDP), the Pentagon’s environmental science and technology program, completed an assessment last year on the vulnerability of the Department’s coastal infrastructure, noting many of the steps needed to adapt to rising seas will be less costly now than in the future. A new “screening level” survey assessment tool, developed by SERDP, was deployed this year to assess other installations. The military is concerned about readiness issues, like the increasing number of “black flag” days, when the wet-bulb globe temperature – a composite of air temperature, humidity, wind chill, and sunlight – is above 90 degrees Fahrenheit and outdoor training is suspended. But a more in-depth look remains on the docket for future study. These developments could undermine already-fragile governments that are unable to respond effectively or challenge currently stable governments, as well as increase competition and tension between countries vying for limited resources. These gaps in governance can create an avenue for extremist ideologies and conditions that foster terrorism. It’s not clear what role the military would have in efforts to stabilize climate-vulnerable states, even if the relationship is better understood at some point. There are concerns about the “securitization” of climate change from those that see building climate resilience as primarily a social or development concern. Emergency response is certainly within the Pentagon’s purview, however, and in addition to raising the possibility of more instability, the roadmap acknowledges the potential for increased disaster relief and humanitarian assistance missions, noting the Department will review and modify capacities as needed. The Department has identified 58 directives, policies, manuals, and guidance documents that do not incorporate climate change but should – at the risk of “adversely impacting the Department’s mission.” A plan for updating them is supposed to be developed this year. Since the last roadmap, several new mandates have been established that require including consideration of changing climate conditions when building new structures, and the authors report there have been scattered individual efforts to harden existing facilities. Besides incorporating climate change into every relevant point along the military’s gargantuan decision-making tree, the roadmap outlines ways the Pentagon and its Senior Sustainability Council, which is in charge of coordinating the roadmap, are looking to work with other federal agencies, environmental stewardship organizations, and foreign militaries. Such military-to-military cooperation around climate change – which Secretary Hagel highlighted in a speech at the Council of Defense Ministers of the Americas in Peru – would build on the Department’s track record of efforts to build cooperation around environmental issues and disasters, and provide an avenue for potentially addressing climate’s destabilizing effects on fragile states. Ensuring supply and acquisition lines are not interrupted, continuing to train effectively, and adapting to new infrastructure and operational environments will all be more difficult without collaboration. The Arctic is a key example: Melting ice is opening the Arctic Circle up to sea travel and possible resource exploitation, requiring the Navy and Coast Guard to adapt to a new environment, as well as work with other Arctic states and key countries (China and India, for example, which joined the Arctic Council last year, despite geography). The roadmap is impressive for its breadth, but many of its core components remain aspirational. The sections on actual results and efforts since the last edition are frustratingly light. There are also places where the military’s ethos of trying to plan for everything runs into the massive scale of the climate challenge. In that respect, the Pentagon is just like the rest of us – increasingly aware of its own vulnerability but not quite able to make many of the changes called for on its own. Sources: Global Green USA, Strategic Environmental Research and Development Program, U.S. Department of Defense, U.S. Navy, The White House. 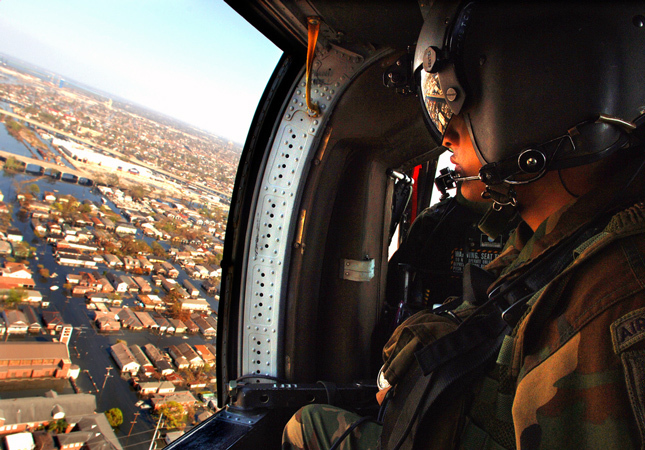 Photo Credit: A U.S. Army helicopter flies over New Orleans after Hurricane Katrina, courtesy of Jacob N. Bailey/U.S. Air Force. The US military has been a multiclimate, all weather fighting force for quite some time. Now, it suddenly needs to be filled with climate warriors? Do we get new MOS’s? Do they end in Bravo Sierra? with threats or more responsibilities to protect these unstable countries. relations between otherwise unfriendly nations. necessary if climate change was allowed to continue occur. recognize that steps to prevent it can be taken as well.